Preservice teacher perspectives: What is science? 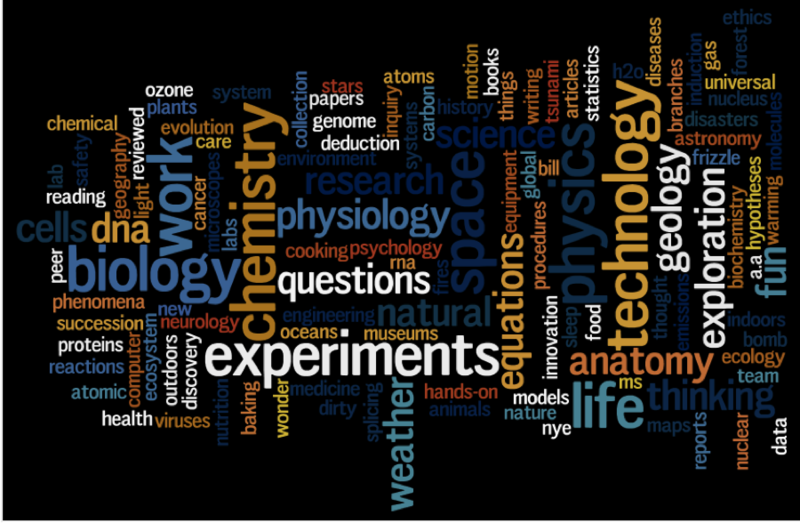 This wordle was created using the output of three different groups of preservice teachers after they held a brainstorming session centered on the question: “What is science?”. The larger words illustrate ideas that were common or recurring among groups. For example, descriptors brainstormed by all groups included: technology, experiments, and the classic disciplines of chemistry, biology and physics. I think these recurring descriptors highlight the stereotypical view of science as a “hard” discipline that uses rigorous tests and experiments in distinct fields to increase our knowledge base and develop technology accordingly. However, if you look at some of the other descriptors that were brainstormed (in smaller letters), you can see that they better capture the breadth of what it truly means to “do” science (e.g. thinking, researching and analyzing in a variety of disciplines that are not necessarily distinct). I think this wordle captures the underlying motivation of scientists, which seek to ask the right questions, explore and wonder at the world’s natural phenomena, and carry out fun investigations to deepen our understanding of the world around us. This simple exercise not only revealed some preconceived ideas of what science is, but also highlighted the broad range of categories that are used to classify scientific inquiry. Elementary: Give students a stack of cards that each list an “activity” and have students sort each card into one of three categories: (1) ‘science’, (2) ‘not science’, (3) ‘unsure.’ (e.g. electronics, computer programming, baking, etc.). Discuss classification results as a large group. Secondary: Have your students read the full, shortened, or ESL-friendly version of Asteroids and Dinosaurs, a story about scientist Walter Alvarez. Ask them to work with a partner to highlight all the words and phrases that indicate that Walter Alvarez was doing science. Consolidate the ideas by discussing as a large group.